New 'smart energy automation' category from Sonnen intrigues integrators; introduces a way to differentiate, capitalize on clean energy movement. The Sonnen ecoLinx system starts at $25,000, and is targetted towards two ideal customers: "Prepper Pete" and "Sunny Sue." Audio systems, automation platforms, speakers, displays, lighting control … these smart home categories have been around for some time and are no strangers to the annual CEDIA Expo. It’s always refreshing to discover something completely novel to the smart home space—something dealers can sink their teeth into and provide another valuable asset to their clientele. At CEDIA Expo 2018 the most popular newcomer, based on the heavy traffic at its booth, was Sonnen. So what exactly is “smart energy automation?” It’s a way of taking energy, be it harvested from solar panels or some other renewable source, or directly from the electrical grid; storing that energy in a battery backup hub located in the home; and applying that energy intelligently to power a variety of different home appliances, smart systems, and electronic products. Sonnen manufactures the storage solution, which has been deployed to homes in Germany for some time. 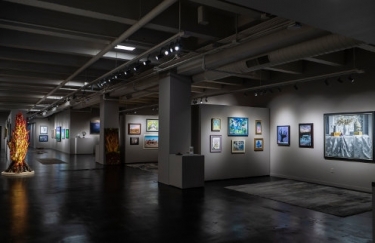 Now, the company is focusing on the U.S. market and hopes to inspire integrators to become dealers of its ecoLinx solution. 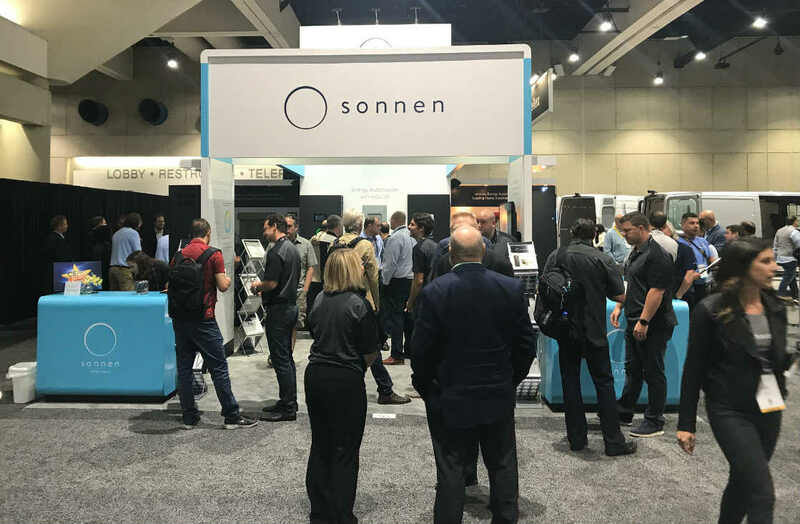 At CEDIA Expo, Sonnen promoted more than just a “good idea” or an “interesting concept.” It demonstrated real, working integration capabilities of its smart storage solution, effectively linking solar and other forms of energy to smart home systems from Control4 and Crestron in a highly intelligent way. In essence, it turns a standalone energy storage system into an element of a complete smart home ecosystem. In a nutshell, here’s how ecoLinx works: Energy—you and your customers decide how much—is stored in the backup batteries. Based on various parameters programmed into the ecoLinx software, which has been specially designed for integration with Control4 and Crestron systems, a certain amount of power is directed to a certain number of electronic products. 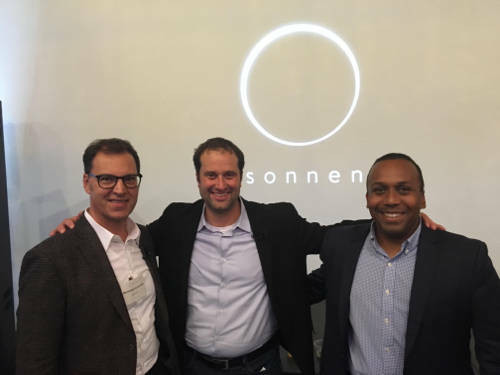 (From left) Sonnen execs Hermann Schweizer, managing director/CTO, Blake Richetta, sr. vice president and head of U.S. operation, and Carlos Restrepo, vice president of technology, were all smiles during the company's CEDIA Expo reception. The big news for integrators is that programming these parameters can now happen via familiar home control platforms. Currently, the Sonnen ecoLinx system includes drivers and software for Control4 and Crestron, but the company plans to develop drivers for other home control platforms. Directly from the ecoLinx portion of Control4/Crestron configuration software, you can program the delivery of energy to appliances based on global scenes, time-based events, and other conditions like a utility’s off-peak and peak energy times. Customers engage with the ecoLinx system from the same interfaces they use to monitor and manage their home’s lights, thermostat, A/V gear and more. For example, in the event of a power outage, a home control system can instruct ecoLinx to provide power every device in the home, a handful of devices, or only the essentials. The system can also help homeowner lead a greener, more energy efficient lifestyle, as the stored power can be used to offset utility bills. During expensive high-demand energy periods, the system can power the home with stored energy, then use grid power during inexpensive, low-demand periods. Built-in weather forecasting capabilities of home control systems can automate the use of stored power. For example, an extreme weather forecast could signal the ecoLinx to cease daily cycling of its battery into the home’s electrical loads and instead raise the backup power reservation to 100 percent in preparation of a storm. The system can manage the use of stored energy to avoid peak utility rates. For example, during expensive high-demand energy periods, the system can power the home with stored energy, then use grid power during inexpensive, low-demand periods. Through integration with Eaton’s intelligent circuit breakers, the Sonnen ecoLinx system knows how much power each circuit requires to run devices and how much energy per hour each circuit will consume. The system also knows how much energy is being produced, how much is being stored, and how much remains in the battery. With this information, it can present directly on a home control app or touchscreen energy usage options to homeowners. The home automation-friendly ecoLinx system is sophisticated and robust, and its price tag reflects it. The smallest storage option—10 kilowatts—retails for $25,000.